Walking in a winter wonderland is nice for awhile, but we’re now reaching that time in the season when everyone’s craving some warmth. Want to trade in sweaters and snowshoes for flip-flops and swim shorts? Check out TicketsatWork.com’s Winter Escapes deals with savings of up to 50% off amazing destinations and attractions from coast to coast. First, let’s hit the beach. TicketsatWork features special offers for some of the most beautiful beach locations in the world. Bahamas – Discover the beautiful Bahamas with savings of 15% and more. Head south to the gorgeous blue Caribbean for memorable snorkeling and diving. And, join thrill-seeking Stuart Cove’s SUBS Adventure aquanauts for an undersea experience. Hawaiian Islands – Save big on exciting adventure tours, famous parks, animal encounters and much more in paradise. Explore Maui, the Big Island, Kauai and Oahu with our selection of top tours and experiences, like the Whale Watch Sail. Experience the playful habits of Maui’s most consistent return visitor – the humpback whale. The waters off West Maui have long been the favored vacation spot of these massive marine mammals. O™ by Cirque du Soleil® – Cirque du Soleil weaves an aquatic tapestry of artistry, surrealism and theatrical romance in this timeless production. Zumanity™ by Cirque du Soleil® – Zumanity – the sensual side of Cirque du Soleil – is a seductive twist on reality, making the provocative playful. KÀ™ by Cirque du Soleil® – The unprecedented epic production by Cirque du Soleil takes adventure to a new level. The Beatles™ LOVE™ by Cirque du Soleil® – Celebrate the musical legacy of The Beatles through enhanced versions of their timeless hits. How about a trek out west to sunny California? Save over 15% for a fun-filled day at Disneyland® California, or save 15% for a sneak peek at the world of movies with the Warner Bros. Studio Tour Hollywood. San Diego Zoo – A must-see attraction, the San Diego Zoo is home to 4,000 rare and amazing animals, including pandas, koalas, tigers, polar bears and more. Right now, save over 15% for a day at the San Diego Zoo. Catalina Express: California – If you buy your tickets now you can save over 10% for the Catalina Express: California. Begin your adventure aboard the Catalina Express where you can take in ocean breezes – keep your eyes peeled to catch a glimpse of white-sided dolphins. For high-octane excitement, nothing beats the roar of engines at the legendary Daytona International Speedway in Daytona Beach. Check out our special offers for six races at the end of January and throughout February, including The Great American Race – The Daytona 500. The big one! The pinnacle for the six decades of historic performances, heroic figures and spectacular moments. Buy now and save! 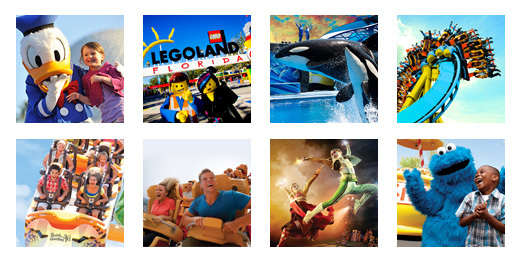 Florida isn’t just synonymous with sunshine – but also theme parks. Escape winter with the whole family. Busch Gardens Tampa Bay – Dive like a bird of prey aboard the thrilling coaster SheiKra. Soar like an eagle, roar like a tiger and giggle with the littlest ones at Sesame Street’s Safari of Fun. Buy a Busch Gardens Tampa 2018 Fun Card and get a 2018 Adventure Island Fun Card free. Warm up your wintertime plans today: Save up to 50% with Winter Escapes!